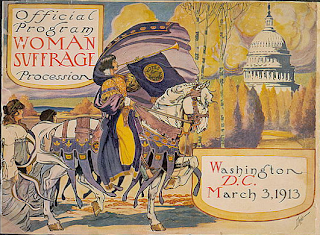 1913 - Cover of program for women's suffrage procession. So, you need an image for that school project, or want some vintage images for that craft idea? The public domain refers to works whose intellectual property rights have expired, or been forfeited. Just because it is "old" does not mean the copyright has expired. Some works may never fully lapse into the public domain. For example, A perpetual crown copyright is held for the Authorized King James Version of the Bible in the UK. So, let's just focus on public domain images available online here in the USA. Did you know that works of the United States Government and various other governments are excluded from copyright law. That does not mean that all images found on .gov websites are public domain since the government may use copyrighted works. State and local governments usually do retain a copyright on their works. Flickr Commons. Here you'll find historical photos from the Smithsonian, NASA, and several universities from around the world. All of the images in Flickr Commons have no known rights restrictions and are free to use. Just run a search within the Commons to find an image you're looking for. http://publicphoto.org - All photo from this site is 100% free for use. http://ushistoryimages.com - 5,000 images from Buchanan's administration through the Civil War. http://www.usa.gov/Topics/Graphics.shtml - A portal to US Government images and photos. "Most of these images and graphics are available for use in the public domain"
Library of Congress - Great old photos from government to baseball.